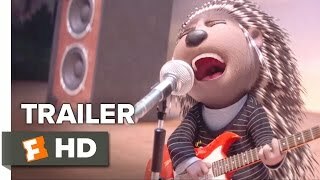 Sing, directed by Garth Jennings, is a family-friendly film all about animals competing in a singing competition. Each with their own unique personalities and talents, the main characters are Buster Moon (Matthew McConaughey), Mrs.Crawley (Garth Jennings), Meena (Tori Kelly), Ash (Scarlett Johansson), Mike (Seth Macfarlane), Johnny (Taron Egerton), Rosita (Reese Witherspoon), Gunter (Nick Kroll) and Eddie (John C. Reilly). Buster Moon is a Koala bear and is the producer of the singing competition. He’s having financial problems with the bank and this serves as the root of the story. Mrs.Crawley is an iguana and has been Buster’s assistant since he bought the Moon Theatre. She causes the biggest problem in the film by her glass eye falling out and hitting the 0 key whilst typing the reward money for the competition, increasing the reward from $1,000 to $100,000! Meena is a tusk-less Indian elephant with grey skin and two pigtails which her hair is tied into. She is very shy and froze during her first audition, but later in the film Buster overhears her singing and is gobsmacked by her performance and gives her a second chance. Ash is a female porcupine and really comes out of her shell over the course of the film, demonstrating significant character development. She and her jerk of a boyfriend audition together, but only she makes the cut, which infuriates her boyfriend so he runs off and finds another girlfriend. Mike is an obnoxious street-singing mouse who makes it through to the latter stages of the competition. His arrogance results in his downfall as he starts gambling and runs into trouble with a few large bears and after his horrible treatment to his peers, they refuse to help him – vengeance is sweet! Johnny the gorilla is the character with the most complex backstory – you empathise with him because his dad is a member of a gang of thieves and makes him tag along. Johnny, similarly to Ash, is a character that shows real character development by gradually exposing elements of his character and personality. Johnny is a natural and beautiful singer and sings from experiences and emotion. Rosita the pig is a devoted wife and mother to 25 piglets. She is put down by her husband and kids, but eventually comes out of her shell and gives a breathtaking performance, proving all her doubters wrong. Overall I loved this film and it teaches children and young people a lot of valuable life lessons. It teaches them of the rewards of coming out of your shell, persistence, and most importantly to always be kind and understanding to others.